Tokyo: Not to be outdone by the ongoing National High School Championship in Koshien (15 days from August 12) and 12U Rubber Baseball National Championship in Tokyo (8 days from August 5 ), girls and boys in different categories of baseball are pursuing glory in their National Tournaments organized by the Japan Rubber Baseball Association (JRBA), the largest sanctioning body of baseball, affiliated with Baseball Federation of Japan. 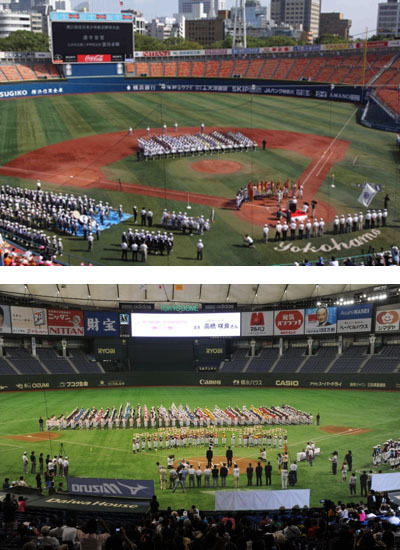 “NPB Girls Tournament 2014 Supported by Chi no Tsubasa” is jointly hosted by JRBA and Nippon Professional Baseball (NPB) and is competed by 36 regional champion teams of primary school children (12U) . They celebrated the Opening Ceremony at Tokyo Dome, home ground of Tokyo Yomiuri Giants of NPB and play in 4 satellite cities in Tokyo for 6 days from August 11. “The 31st Japan Junior High Rubber Baseball Championship”, often called “Koshien of Junior High” along with “Koshien of Primary School”, is joined by16 Regional champions, is hosted by JRBA and Yokohama City and will last for 4 days from August 11． Competition site is Yokohama Stadium, home ground of Yokohama DeNA BayStars of NPB.